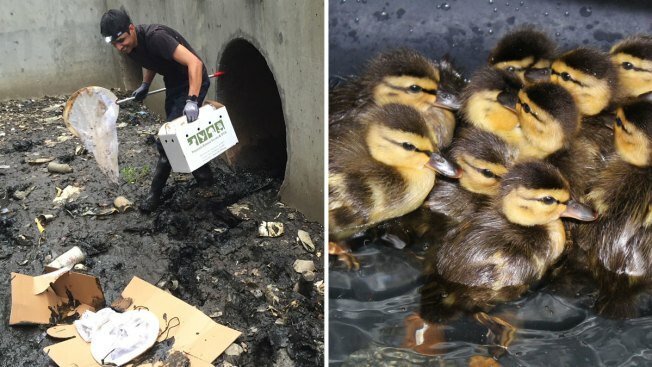 A rescue team on Monday managed to save eight ducklings that were trapped in the mud at the bottom of a storm drain in San Mateo, according to the Peninsula Humane Society and SPCA. The baby ducks are "doing well" as they recover at the PHS/SPCA’s Wildlife Care Center. Their mother flew away during the rescue mission and never returned. A motorist first came across the ducklings when they spotted a mother duck pacing near a storm grate located near the Poplar Avenue exit of southbound Highway 101, according to the PHS/SPCA. The motorist promptly called the PHS/SPCA after seeing the ducklings at the bottom of the storm drain. Rescuers corralled the ducklings and transported them back to the PHS/SPCA’s Wildlife Care Center, according to the PHS/SPCA. "After the ducklings had been rescued, our staff waited to see if the mother duck would return, but unfortunately she did not," Buffy Martin Tarbox, PHS/SPCA’s Communications Manager, said in a statement. "The ducklings would not have survived on their own in the wild. Once they are older and self-sufficient, we will return them to the wild." The rescued ducklings are being housed with another group of abandoned baby ducks at the wildlife center, according to the PHS/SPCA. "Ducklings are very accepting and thrive in groups, so we combined the two groups and they are all doing very well," Tarbox said in an email.